The main slogan of Egyptian revolutionaries last year was "Bread, freedom and social justice." What role will the poor play in the ongoing Arab Spring, asked Ayman El-Sayyid, editor-in-chief of Weghat Nazar magazine, at the beginning of a roundtable devoted to reflections on the Arab uprisings one year later. The roundtable was held at the closing session of the launch of the 2011 Arab Development Challenges report, released by the United Nations Development Programme. Before listening to attendees’ various points of view, organisers recalled that anti-regime anger hadn't erupted suddenly on 25 January 2011, but had built up for years. They showed footage of labour protests in which Egyptian workers demanded a minimum wage and other economic and social rights, which had broken out a full year before last year's revolution. “Those who have power aren't interested in human development and those who are interested in implementing such changes don't have any power," said Galal Amin, an economics professor at the American University in Cairo. "This is a key issue for development, and that makes the development issue not just a technical, economic problem, but a political one." The left-leaning economist said that if the current dynamic continued, genuine analysis of the situation could not be made, especially since state authorities generally failed to provide adequate data or accurate explanations of events. "My definition of the 'developmental state' is when both ruler and ruled are unified by respect for the law, good planning and revenue distribution," said Amin. In the case of the Arab region, he added, inter-Arab cooperation should be added to the equation. Amin believes that the Egyptian revolution, along with other Arab uprisings, has had many positive aspects. For one, he said, public participation has been broad, encompassing various social classes, different religions and both genders, while revolutionary slogans have supported social justice. “In Egypt, those who won parliamentary elections were not the most revolutionary," stated Saad Eddin Ibrahim, sociology professor at the American University in Cairo. “The same thing happened in other revolutions, like the Iranian, Russian and French revolutions." Hassan Malek, leading member of the Muslim Brotherhood's Freedom and justice Party and a businessman, expressed a different point of view. “Revolutionaries called for 'dignity, freedom and social justice' – not for ‘bread, freedom and social justice'," he said. "Al-Bouaziz in Tunisia, for instance, set himself on fire because his dignity was offended." In response to predictions by some observers of a "hunger revolution" if social justice isn't quickly established, Malek believes this to be overly pessimistic, saying that "cultural and religious beliefs" would prevent such an outcome. For Malek, independence of the judiciary is a key motor of reform. He also emphasised the importance of the private sector's role in the development process, along with the role of the state in regulating economic activity and combating corruption. Malek also said that social solidarity between people, which, he said, was a key factor for the survival of the poor in Egypt, should contribute to redressing the situation. He also underlined the importance of giving Arab oil wealth a role in national and regional development, which the Mubarak regime didn’t always allow. 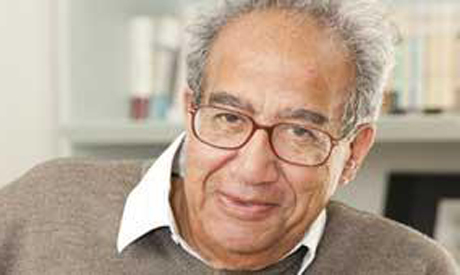 Malek went on to posit "values and ethics" as key factors of development. "We all agree on the same general picture, but the organisation of priorities can make a huge difference on the ground," said Amin. "Mr. Malek puts much emphasis on ethics, which is an important issue. But the priority, from my point of view, is to solve economic problems. Improving living conditions will improve public morals – not the other way around. Those living in poverty don't care about ethics." Asked about the Muslim Brotherhood's economic programme, Malek presented a brief plan without much in the way of detail. "We have a deficit in the balance of payment and a budget deficit, among other macroeconomic problems – these must be solved in the short term," he said. "We should also complete the political process to be able to forge a new constitution." "After achieving these goals, we must focus on improving education and other reforms that should be carried out over the coming five years," Malek added. "Our overriding objective is the rebirth of Egypt on multiple levels, and this could take anywhere between 20 and 30 years."